A Serendipitous Find of 2007 Drew Pinot Noirs A few missing cases of the outstanding 2007 Pinot Noirs were recently discovered in the storage warehouse. 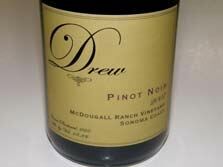 Visit the website at www.drewwines.com to see more information of the 2007 McDougall Ranch, 2007 Savoy, 2007, Monument Tree and 2007 Fog-Eater Pinot Noirs. Keefer Ranch Offering Holiday Cheer The terrific 2007 Keefer Ranch Pinot Noir is being offered through 12/31/09 at a 20% savings - $34. Visit the website at www.keeferranch.com or phone 707-829-5950. Cathay Pacific Hong Kong International Wine and Spirits Competition Gold Medal winners from New Zealand include 2007 Amisfield, 2007 Grasshopper Rock, 2007 Tohu, 2007 Wither Hills, and 2007 Wooing Tree (Best New World Pinot Noir and Best Overall Pinot Noir). Wooing Tree is a family owned single vineyard site in Central Otago next to the town of Cromwell specializing in Pinot Noir. The winery’s 2007 Pinot Noir has won multiple gold medals in competitions this year. Unfortunately, I can’t find any domestic retail availability. Americans Buy More, Cheaper Wines Total U.S. wine sales rose in 2009 but sales of wines priced above $25 a bottle fell in the past year. Prices of grapes have dropped precipitously making business difficult for many growers. The price of Pinot Noir on the spot market is said to be down 43%. Some growers are custom crushing their grapes and storing the wine to sell on the bulk market in the future rather then accepting a very low offer on their grapes. Small wineries are the hardest hit and it is surprising that more of them have not gone out of business. It is not clear that consumers will ever return to their old buying habits. ¡Salud! The Oregon Pinot Noir Auction Raises Over $607,000 The two day event, held November 13 and 14, 2009, was attended by over 400 guests. The event offered the first en masse tasting of the exciting 2008 Oregon Pinot Noirs. One of the live auction items was a Russian River Valley Immersion Weekend hosted by the Prince of Pinot that included lodging at the Benovia cottage, hosted luncheons at Benovia and Lynmar, special tastings at george and Kosta Browne, and a tasting of rare Russian River Valley cult Pinot Noirs. Plan to attend the 2010 event to be held November 12 and 13 in the Willamette Valley where I will offer another Pinot Noir Immersion weekend. All proceeds go to the medical and dental care of seasonal vineyard workers in Oregon. Visit the website at www.saludauction.org. Breggo Cellars Sold to Cliff Lede Napa’s Cliff Lede Winery, which focuses on Bordeaux-style blends and Sauvignon Blanc, has bought Breggo Cellars, a noted producer of Pinot Noir, Pinot Gris and Chardonnay in the Anderson Valley. 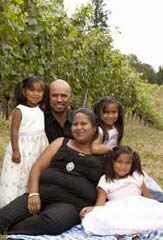 Breggo Cellars was founded in 2005 by Douglas Stewart and his spouse Ana Lucia Benitez-Stewart. A small winery and tasting room was established on Highway 128 north of Boonville and 7 acres of grapes were planted. Breggo (boontling for sheep) will retain the Stewarts as equity partners and Ryan Hodgins as winemaker. Breggo’s 2006 Savoy Vineyard Anderson Valley Chardonnay is a killer! Visit the website at www.breggocellars.com. SanTásti Evaluated San Tásti is a new lightly carbonated palate cleansing drink designed to stimulate saliva flow and remove tannin buildup from the mouth. I tried a few sips on several occasions while tasting wines. I found that it gave a sensation of dryness in my mouth with a slight taste of citrus that did not linger. It did seem to neutralize astringent tannin buildup and can be a welcome addition to wine tasting protocols. About $1.75 for a12 oz bottle. Visit www.crackersareforslackers.com. Shared Ownership Opportunity in Balinard Vineyard Estate Matt Reidy. an awardwinning Pinot Noir winemaker and vineyard owner, is looking for three wine enthusiasts to invest alongside of him in his established Balinard Vineyard Estate, an existing, super premium Pinot Noir vineyard and beautiful home site property located in the heart of Sonoma County’s Russian River Valley grape growing area near Sebastopol, Occidental, Graton and Freestone. The entire property consists of 4.8 acres lying within the boundaries of both the Green Valley and Russian River Valley AVAs. The property would be shared in 25% interests between three new partners and Matt. Design drawings are being finished for the new home to be developed on the property. Construction will begin next spring. The modern architectural vernacular of the design is in keeping with the many period country farm houses found throughout the area and will feature modern features throughout. The wine country retreat will take full advantage of the vineyard and outdoor entertaining. Plans include a pool, large wrap around covered porch, automated formal gate with hardscape elements, extensive landscaping, organic herb and vegetable garden, built-in outdoor grill, and several al fresco dining areas and fire pit. The floor plan of the house will be an ideal place for entertaining family and friends and allow the partners to easily share the space. There will be a gourmet kitchen and wine cellar for each partner. The home will include 2 spacious master suites, a media room, an office, two additional bedrooms, and four and half bathrooms. The approximately 3,100 square foot home will be furnished using a comfortable modern design aesthetic. The 2.5-acre organic Pinot Noir vineyard was planted to clones 115, Calera and a special suitcase Vosne-Romanee selection in 2007. Greg Adams, noted regional viticulturist known as “Dr. Dirt,” created the vineyard development plan and continues to monitor the vineyard. Another 0.5 acres of Pommard clone Pinot Noir will be added. Matt will lease the vines from the owners and pay 100% of all certified vineyard farming expenses. Each partner will be given the opportunity to create up to 10 cases of premium Pinot Noir from the vineyard with Matt at cost. The owners will benefit from income generated from vacation rentals when the partners are not in residence, and investment potential of the property. Matt will serve as the property manager. By sharing ownership, the partners will have all the benefits of the vineyard and home without the exposure of owning 100% of the property which dramatically reduces the cost of purchase, carrying costs, and attendant hassles of whole ownership. Each partner’s total net equity investment is expected to be $395,658 after debt. I spoke at length by phone with Matt about this shared ownership opportunity (I am not a participant in this but find it very appealing). Fractional resort properties among exclusive vineyard regions have become very popular. Most of these developments, such as Calistoga Ranch in the Napa Valley and The Orchard at the Carneros Inn, are quite large and expensive making Matt’s shared ownership opportunity all the more attractive. Contact Matt at MReidy@FremontGroup.com. Consider Portland in Winter Sure it rains cats and dogs, but winter is a great time to take advantage of fantastic deals in the city. Hotel Modera is offering packages for $125 a night that include valet parking, ecofriendly Modera shopping tote, bottle of Oregon wine, bottled water, Oregon hazelnuts, 250 Alaskan Airline miles, discount coupons from downtown Portland retailers, and a complimentary appetizer with two entrees at Nel Centro Restaurant. While your in town, visit one of the many wine bars including Bar Avignon, Carafe Bistro & Wine Bar, Grolla Restaurant & Wine Bar, Korkage, Pour Wine Bar Bistro, MetroVino, Noble Rot, Pour Wine Bar Bistro, Sip D’Vine, Terroir Restaurant & Wine Bar, Thirst Wine Bar & Bistro, and Vino Paradiso Wine Bar & Bistro Book by December 31, 2009, by phoning 877-484-1084 or online at www.hotelmodera.com, and entering “save” in the Promotional Code. Decant Your Champagne During the Holidays Charles Heidsieck Champagne and Riedel Crystal have partnered in designing a new lyre-shaped decanter specifically for Champagne. 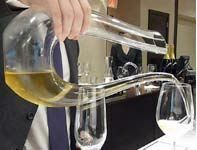 The purpose behind decanting fine Champagne is that decanting warms and aerates the Champagne, bringing out the nuances of the Champagne, just as it does for still wines. The decanter’s shape preserves the bubbles. Handmade and mouth-blown, the decanters are offered in a wood and leather-lined box set, together with a bottle of 1995 Charles Heidsieck Blanc des Millenaires. Retail price is $600. Another tip: consider drinking your fine Champagne from white wine glasses used for Chardonnay because this allows more aeration, making the Champagne richer and more expressive. The Champagnois never use flutes for Champagne! Extinguishing the virus with wine Dr. Scott Hanlon of Chicago recently put on a “Vaccine and Vino” event at the South Loop Wine Cellar. A flu shot was offered along with a tasting of five wines for $40. The idea was to encourage more adults to get flue shots and apparently it worked. La Paulée de San Francisco Daniel Johnnes presents La Paulée returning to San Francisco March 11, 12 and 13, 2010. Forty-four top Burgundy estates will be on hand to showcase their great wines. This weekend-long all-Burgundy extravaganza is an incredible opportunity to mingle with winemakers and taste current and older vintages from the finest Domaines of Burgundy such as Domaine Marquix D’Angerville, Domaine de L’Arlot, Bouchard Pére et Fils, Joseph Drouhin, Domaine Dujac, Domaine Faiveley, Camille Giroud, Maison Louis Jadot, Domaine des Comtes Lafon, Domaine Perrot-Minot, Domaine Ramonet, Domaine Michéle et Patrice Rion, Domaine Georges Roumier, Domaine de la Vougeraie. Thursday, March 11: The Collectors Lunch featuring the wines of Pierre-Yves Colin-Morey and Domaine de Montille. Friday, March 12: Zachys All Burgundy Auction, The Verticals (Three vintage verticals of each participating Domaine’s flagship wine), and Rare Wine Dinner (Celebrating 25 years of Burgundies from Domaines Dujac, Leflaive and Faiveley). Saturday: Burghound Seminar (A Study of Terroir with Joseph Drouhin and Maison Louis Jadot), The Grand Tasting (A walk around tasting showcasing the current vintages from all participating Domaines), and The Gala Dinner (The Marquis event). The events feature the cuisine of Michael Mina, Daniel Bouloud, Michael Troisgros and Corey Lee. Wine service will be led by fifty of this nation’s most noted sommeliers. Prices range from $135 for the Burghound Seminar to $2,750 for the Rare Wine Dinner. Attend all events for $5,275! For tickets and information visit www.lapaulee.com. Give the Gift of Safety Personal breathalyzers have become very reliable and give accurate results in seconds. Their compact size makes them easy to keep in a purse or coat pocket. The BACTRACK B70 Digital Breathalyzer is one of the newest ($80). No mouthpiece is necessary - simply exhale into the breath tube for testing. Because the device does not require users to touch their lips to a mouthpiece, it is easy to share with multiple users. 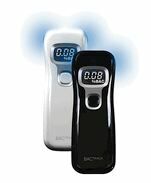 View this and other personal breathalyzers at www.breathalyzer.net. ForeFront has Stamp of Gary & Nancy Andrus Three new wines under the ForeFront label have been released by the Crimson Wine Group. The new label is inspired by wine industry pioneer Gary Andrus, who, together with his wife Nancy, established Pinot Ridge Vineyards in 1978 in Napa Valley, as well as Archery Summit Vineyards in the Willamette Valley in 1993. The Andruses were among to first to encourage tight vine spacing in the vineyard, implement gravity flow in the cellar, and hire a female winemaker in the 1970s. The portfolio of ForeFront wines includes a Cabernet Sauvignon, Sauvignon Blanc, and Pinot Noir, all priced in the $16 to $24 range. The 2008 Pinot Noir is sourced primarily from the Dundee Hills AVA. The wines are crafted by winemaker Michael Beaulac who is at the home vineyard of Pine Ridge. For more information on the wines including a video over view, visit http://forefrontwines.com/wines.html. La Luz Wines from The Eyrie Vineyards Michael Alberty at Story Teller Wine Company in Portland is offering a special Pinot Noir and Chardonnay which have never been made before. The La Luz wines were crafted by Jason Lett, replacing for one year his own label, Black Cap. Eyrie’s cellarmaster, Julio Hernandez, is a very important part of the Eyrie Vineyards family. His wife, Guadalupe, a mother of three, is suffering renal failure and badly needs a kidney transplant. The Lett family offered a library offering of all of their Reserve Chardonnays last summer as a fund raising effort. Some of these wines are still available. Eyre Vineyards is donating all proceeds from the sale of La Luz wines to Lupe’s fund and Story Teller owner, Michael Alberty, is donating $5 for every bottle sold. Regarding the Chardonnay, Alberty says, “It’s just so darned elegant and sharp that just by holding the glass in your hand you will feel like Peter Lawford enjoying the stars in the desert sky while standing on the balcony of Steve McQueen’s pad.” The La Luz Pinot Noir is a multi-vintage wine made with fruit off of own-rooted vines from Eyrie’s Rolling Green Vineyard planted in 1988 and Jeremy Saville’s Bishop Creek Vineyard, also planted in 1988 in the Yamhill- Carlton District. Alberty says, “The nose on this wine, with that savory meat quality, could be a poster child for the umami movement.” These wines are very, very good and only $36 a bottle. Lett put his entire 2007 Black Cap vintage into these two wines and Black Cap wines normally sell for $50 to $60 a bottle. Contact Michael Alberty at www.StorytellerWine.com or 503-206-7029, 800-753-2531.